In a strong signal of support for Career Technical Education (CTE) and career readiness in high school, 40 states are now measuring career readiness in their state or federal high school accountability systems. Fewer than half as many – 17 – were measuring career readiness just five years ago. The sophistication and design of the measures has evolved as well, and many states are working to intentionally link their accountability systems with high-quality career pathways. That’s according to a new analysis from Advance CTE, Education Strategy Group, Achieve and the Council of Chief State School Officers. The report, the third edition in the Making Career Readiness Count series, uses a four-pronged framework that was developed by an expert workgroup and outlined in the report Destination Known: Valuing College AND Career Readiness in State Accountability Systems to categorize how states are measuring college and career readiness. Progress toward Post-High School Credential: Student demonstration of successful progress toward credentials of value beyond high school. Co-curricular Learning and Leadership Experiences: Student completion of state-defined co-curricular experience(s) aligned to students’ academic and career plans. Assessment of Readiness: Students scoring at the college- and career-ready level on assessment(s) that are validated by higher education and industry. Transitions beyond High School: Successful student transition includes placement into postsecondary education, training or the workforce within 12 months of graduation. Overall, the most common measure used across the states is Assessment of Readiness, with thirty states and the District of Columbia valuing experiences that are aligned with the Destination Known recommendations. Another 12 states include out of sequence measures that are aligned with this indicator but do not include the Fundamental measure, attainment of state-defined college- and career-ready level on a high school summative assessment. The vast majority of states counted under the Assessment of Readiness category are measuring industry-recognized credential attainment. 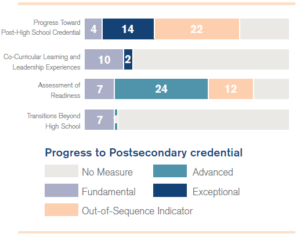 Another commonly used measure is Progress Toward Post-High School Credential. Seventeen states and the District of Columbia include measures aligned with the Destination Known recommendations, and another 22 states include out of sequence indicators. A number of states include either pathway completion or dual enrollment coursework in their accountability plans without requiring that experience to be accompanied by the completion of a state-defined college- and career-ready course of study, which is the Fundamental measurement in this category. Twelve states include a Co-Curricular Learning and Leadership Experiences measure in their state or federal accountability systems, often looking at work-based learning participation. Eight states include information on Transitions Beyond High School, reporting either postsecondary enrollment or postsecondary enrollment without the need for remediation. With all of the progress states have made, there is still room to strengthen and improve measures of career readiness. For example, states should be explicit about how career readiness components – such as work-based learning, industry-recognized credentials and dual enrollment – align to each other and to a students’ career pathways. They should also be transparent with their data and put thought and care into designing accountability systems that value and encourage the experiences that are best aligned with the outcomes they want for students. These and other opportunities are discussed in the report, Making Career Readiness Count 3.0. The even harder work ahead is to support all students in their preparation for and transition to college, career and life. Regardless of the path students choose to pursue, they need to be transition ready. 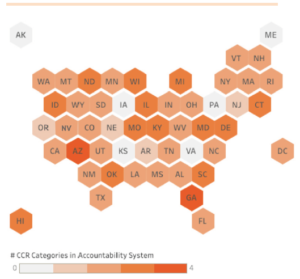 State and federal accountability systems can and should be used to highlight areas for improvement and connect programs and students with the supports they need to be successful. The Council of Chief State School Officers (CCSSO) brought together leaders in K-12, higher education andÂ the business community today to discuss recommendations from CCSSO’sÂ newly released reportÂ encouraging states to make career readiness a priority. The report, Opportunities and Options: Making Career Preparation work for Students, resulted from a year-long taskforce including K-12, higher education and affiliate groups such as NASDCTEc. Opportunities and Options, supported by 43 states and territories to date,Â presents aÂ clear set of actions states can take to close the skills gap and ensure more students graduate from high school prepared for high-skill, high-demand careers. Maura Banta, IBM’s Director of Global Citizen Initiatives in Education and task force representative reiterated the necessity of partnering business and education to create career-ready workers if the U.S. is to remain a global competitor. To accomplish this, businesses can take the lead in showcasing their passion for collaborating with education, developing staff-buy in and focusing on both short term and long term outcomes. Terry Holliday, Kentucky Education Commissioner and Career Readiness Task Force Chairman urged states to develop high-quality pathways that help all students reach successful careers in their communities. To that end, Holliday urged local and national groups representing education, business and stakeholders, to streamline credentials and certifications to help students determine what credentials are necessary in today’s workforce. Scott Ralls, North Carolina Community College Systems President discussed the interest gap that exists in CTE, and called on states to work with students earlier to showcase the opportunities that exist within CTE, and how it can prepare students for living wage careers. Lastly, June Atkinson, North Carolina Superintendent of Public Instruction and incoming President of CCSSO, outlined a series of theÂ waysÂ in which CTE can move forward. She highlighted Opportunities and Options’ capability to serve as a resource forÂ recommendations for Carl D. Perkins ActÂ reauthorization; the opportunityÂ for states to network toÂ share information, challenges and lessons learned; and the necessity to engage State Governors to move the CTE agenda forward. To learn more about the report, find NASDCTEc’s press release here, and the full report here.